To be prepared for college and careers of the future, students must become adept at collaboration today. 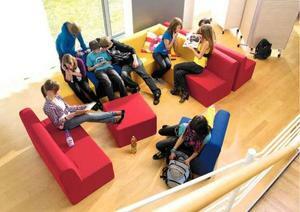 Research shows that physical space alone can improve student learning. The classroom environment itself also sets the tone for what a teacher expects of students. The classrooms of yesterday, with a focus on a teacher at the front of the room and students in rows of desk, will not deliver the 21st century learning skills students need for their future endeavors. Educators want to encourage students to communicate, and be creative and collaborative problem solvers in an environment where they feel comfortable and safe to take risks as they learn. As part of its Long-Range Facilities Master Plan, the El Segundo Unified School District plans to convert all its K-12 classrooms to a “next generation classroom” design, classroom by classroom, as funding becomes available. Recently, the District installed four new modular classrooms at El Segundo Middle School that are outfitted as next generation classrooms with appropriate technology and flexible furnishings that can be reconfigured as needed for different learning scenarios. “We want all ESUSD classrooms to reflect this design in the near future,” said Plotkin. 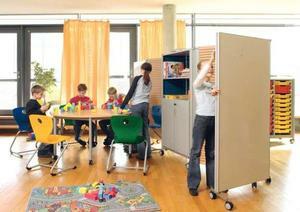 Clusters: small, moveable clusters of desks and chairs accommodate today’s learners who prefer interactive and social activities. Learning Zones: learning zones–collaborative, independent, and more–turn one classroom into several defined places that direct the learning behavior desired. Defined learning zones empower students to move freely to the area that suits the work they are doing. Teacher Mobility: teachers should be able to move freely about the room with no barriers. This makes it easier for the teacher to move from group to group to answer questions and facilitate discussions. 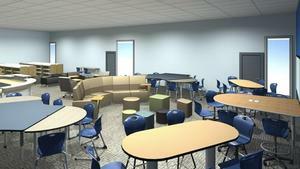 A student-centered school and classroom design is one of the most important K-12 innovations of the last decade. Research shows that classroom design influences levels of student interaction and engagement, and in turn, engagement and active learning improve retention. ESUSD believes a significant opportunity exists for maximizing learning and creating meaningful experiences by reimaging the classroom environment. Photos showcase some of the key elements of a student-centered, next generation classroom.